I anxiously had been waiting for the decals for this car. I had it complete and ready to go when they came in the mail. I finished it after returning from Atlanta and watching Jeff clinch his 4th title! Made finishing the kit with Slixx decals great fun! 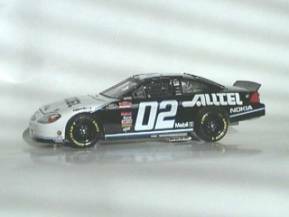 Just finished the 02 Alltel car with Slixx decals. (what else is there?) I also used some scrap decal material to simulate tape over the hood pins, and used fine black thread to simulate the plastic staps used to attach the roll bar padding inside the car. Additionally I left the steering wheel resting on the dash, as it is usually never attached when the driver is out of the car except when they roll it on to the grid. Tires were sanded to simulate scuffs and electrical tape for the window bars. Can't wait for the Dodge kits to come out! I just completed the #38 Busch Car sponsored by Great Clips. 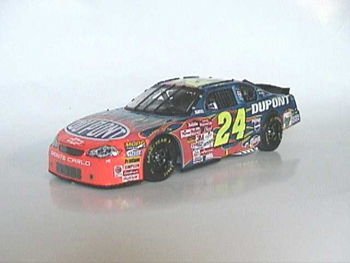 One of the nice things about Slixx Decals, is you can build cars you might not purchase as a Diecast Car. In this case, I get my hair cut at Great Clips so I built the car they sponsor. This is the first time I used the new "Goodies" decals, the safety harness assembly, tear-off strips, window frames etc, add yet another level of realism to the kit when finished. I also built up the side head restraints on the driver seat per the new designs being used, and used the "sticker" decals on the tires. The safety net is down, and the wheel sitting on the dash as it would look like on the grid. Looks like the 24 team is ready to qualify. Hood pins are taped, and it looks like they're looking for a little extra down-force on the right front of the car. Only the best for the 24 crew, including Slixx Decals! Hours of masking, painting and Slixx Decals pay off. 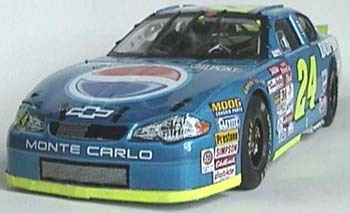 Sure miss Mark in the Busch Series. Can't say I'm a huge fan of "Front Row Joe," but I always thought this particular paint job was one of the best on the circuit. Slixx Decals helped make this kit a nice addition to my collection. First of the new Dodge kits I've built from Monogram. 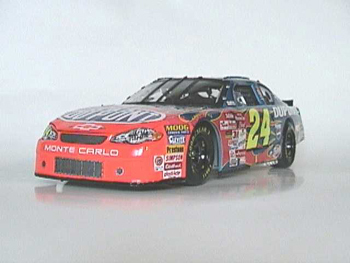 Didn't use the roof spoiler, I always thought that was one of NASCAR's ungliest innovations. 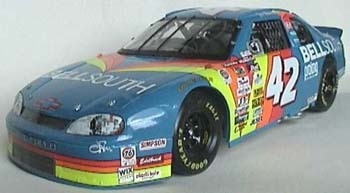 I ordered up a set of SLIXX Decals and built the #22 Ward Burton Cat Dodge. 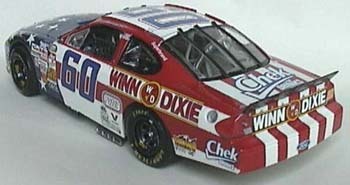 If you take a close look at the right-rear quarter panel, looks like the Daytona win attracted a new associate sponsor. 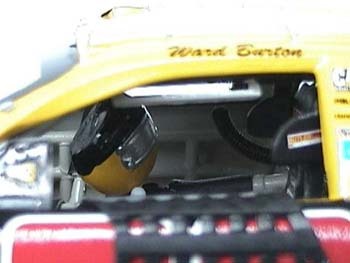 The team has Ward's helmet hung inside the car, let's go racing!